Interested in outsourcing your study? 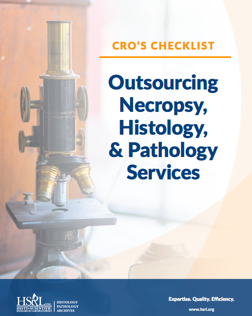 Outsourcing necropsy, histology, and pathology services continues to increase as CROs strive to maximize their resources, increase their productivity, and expand their capabilities without expanding their workforce. Many organizations have come to see that outsourcing can seamlessly offer the same quality of work for prices competitive enough to be less expensive than internal operations. Use this outsourcing checklist as a guide to help you determine the qualifications of each contract laboratory and find the service provider you need.